A polyester allergy is a type of contact dermatitis: an allergic reaction to substances that come in contact with the skin. Adhesives, solvents and clothing containing latex, nylon or spandex all could contain enough polyester to cause a reaction. Itching at the site of contact is the most common symptom of contact dermatitis, including a polyester allergy. In combination with itching, a rash may appear. 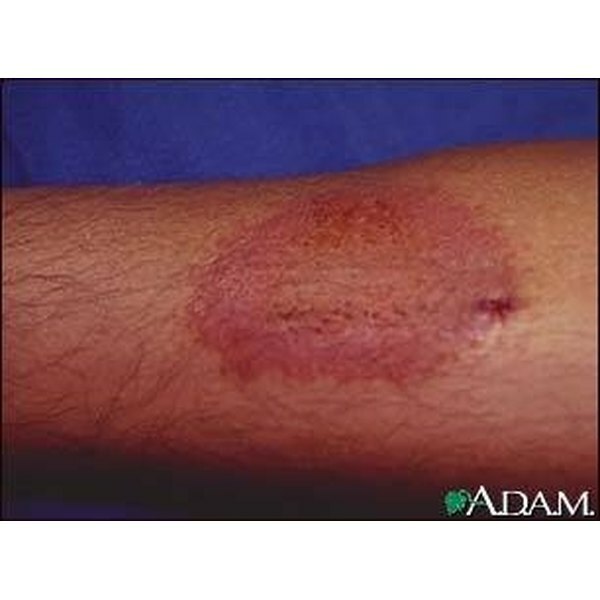 Scratching will only make the rash worse and could cause it to spread or form lesions. Polyester allergies don't affect everyone the same, but swelling, redness, warmth and tenderness often occur at the site of contact. A respiratory reaction, such as shortness of breath, is common among latex glove users who are allergic to polyester. If already suffering from the skin condition eczema, contact dermatitis may make the allergic reaction worse. Thoroughly wash the skin before applying topical corticosteroid skin creams or ointments. In severe cases, a short-term dose of an oral corticosteroid may be needed. In general, with proper treatment, the condition should recede or disappear within two to three weeks. Avoid reactions by carefully handling adhesives and solvents containing polyester and wearing gloves that don't contain latex. Avoid polyester clothing. L.A. O'Hare studied writing at the University of Arkansas at Little Rock, where she focused on writing and editing. Her work has appeared in Xit, Dead Mule, WritersWeekly.com. She worked as an LPN and was editor of two "for the love of" online publications.